Get Your I Heart Chickens Coffee Mug! OH! NO! MICE IN THE HEN HOUSE! My Chicken Loves to Cuddle! What do you think about Commercial Egg Production? Roosters alert owner to robbery in Mineral Wells Texas: The Weekly Crow, Aug. 2011. Vote to Legalize Backyard Chickens for Every City in the U.S.
Show us how smart your chicken is! Each week we try to feature a new smart chicken and we give an award ribbon to the smartest ones we find. We asked you to tell us how smart your chickens are and you did! We love true stories about smart chickens. If you have a video of a smart chicken you want us to feature just email us your video to chickenheavenonearth@gmail.com. We love to feature smart chickens, not just because they are fun, interesting, and amazing to watch but to prove that chickens have a very high intelligence level because we are currently studying chicken intelligence. We love and appreciate the effort and dedication that these chickens owners take to train their chickens <3..Okay, okay, it's simply because I just love chickens and I am totally amazed at how smart they are and I love to tell people about them. Most people who have never been around chickens, don't believe me, so I show them these videos and then they are amazed too and so will you be. Our most recent Show Off Your Chicken Winner was Aunt Jemima-A Card Playing Hen. We don't always find a smart chicken every single week but when we do they are featured on this page. Former winners are listed below. Einstinia-This hen can tell the difference between pictures of different animals on cards! See Einstinia-Smart Chicken! Chickens are obviously smart but how smart they really are you will never know until you start training them. As you can see from the smart chickens we have featured, the more training your chicken has, the smarter it gets. Here are some good deals on training tools many people use to train their chickens and other pets. ​You can also get our attention by tagging Chicken Heaven on Earth and Smart Chickens on your Youtube video's about talented, smart chickens. We search for new smart chickens every week. See More Smart Chickens On Chicks Can Do Tricks! ​Proof of chicken intelligence, agility, cognitive abilities, training, relationship development between humans and other chickens, and more! 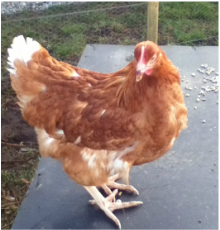 See Smart Chickens and Find out how smart chickens really are! You could win cool prizes for your chickens! It's easy, just fill out our short official entry form and upload your photo that you want entered in the contest. We will select a new winner on the 4th day every month, announce them and the prize for the next drawing on our official entry form page.If you entered the first drawing and did not win your photos will automatically be entered into the next drawing. If you have not entered your photos yet, you can enter the contest now and be eligible for this contest and the next ones for the rest of the year. Just fill out a short form, upload your photo and you are eligible to win a prize. A new winner is chosen every month. Rev. Penny Dean with Lil' Snowball & Sweet Pea. We are currently in need of feed, supplies, medical care for rescued chickens, dogs, cats, and other animals at our sanctuary and an expansion so we can purchase a larger farm. Any amount would be greatly appreciated. We don't keep them in tiny cages like most traditional animal shelters do. All of the birds and animals at Chicken Heaven On Earth are free range on almost 2 acres after they are vetted, dewormed, neutered, spayed, and kept parasite free in a safe farm environment. Each year we are pushed to our limits taking in rescued chickens and other small animals. Funding is few and far between. We have created a business plan to help Chicken Heaven On Earth Sanctuary grow and be able to support itself at the same time as a sustainable free range egg production, growing fruits and vegetables to sell, raising honey bees, as well as, small rental houses, and basically becoming a viable and financial commercial farming operation with truly free range happy chickens with no battery cages that live out their lives with no stress or fear of being eaten.. The amount needed to accomplish this goal is $300, 000.00. Any amount would be greatly appreciated--Every dollar counts toward our goal. Many of our viewers are trying to find loving forever homes for their pet chickens and we have many rescued roosters who need homes or sponsors as well.